A girl travels to Haiti to marry his fiancee, but with the help of a poisoned rose, she becomes victim of a local sugar factory owner, who uses zombies as slave labor. The necromancer takes the girl to his castle, but he will be killed by one of his zombies. A very low budget horror movie, but extraordinarily evocative, with a superb Bela Lugosi. The term "zombie" became of common use in 1929 thanks to a book about Haiti by William B. Seabrook titled "The Magic Island". 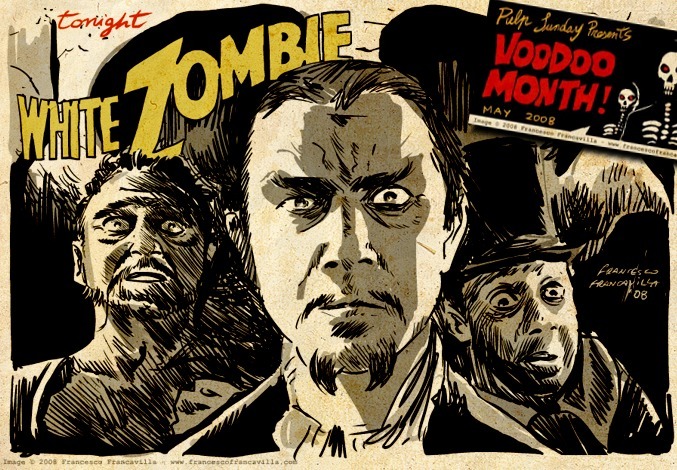 White Zombie (1932) by Victor Halperin can be considered the first authentic zombie-movie. In Haiti, between voodoo dolls and powerful black magic, Bela Lugosi is Murder Legendre, a satanic individual who enslaves zombies in his mill. When a worried John Harron asks who are these weird, cadaveric people without sign of life and personality, Lugosi answers "For you, my friend, they are simply the angels of Death!". 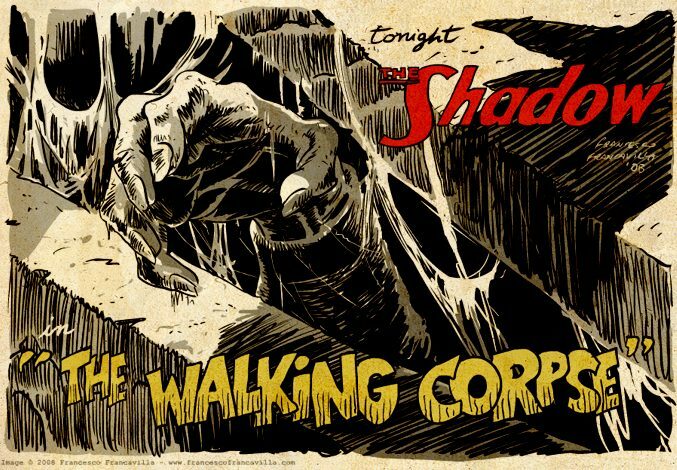 Today we continue Pulp Sunday Presents: Voodoo Month with this radio episode of the Shadow titled: "THE WALKING CORPSE"!!! A woman asks Lamont and Margot to find her missing brother who is apparently involved in a voodoo cult. The first person on Lamont's list of people to ask for information, Lopez, is found dead, strangled by someone who was electrecuted a month earlier. A little black hand found close tot he body seems to validate the voodoo aspect of this mystery. Next on the list is Mama Segreto, who also is member of the cult. She doesn't give much information on finding the missing person but later she is strangled by the same "killer zombie" who took care of Lopez. 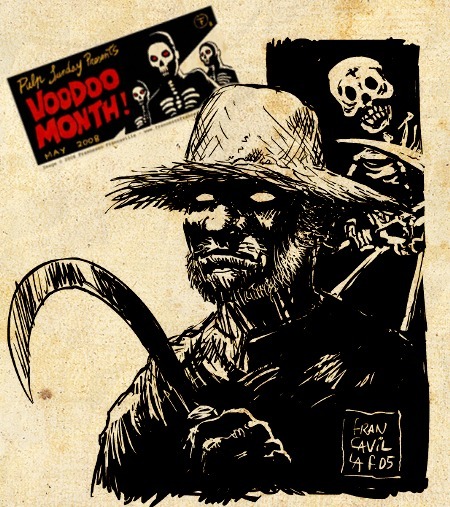 Listen this episode from the Internet Archive and look forward for more in this "VOODOO MONTH"!!! Like other films directed by Jacques Tourneur and produced by Val Lewton, especially “Cat People,” this one excels in great black-and-white visuals and cinematography. Tourneur uses very atmospheric techniques to give the film a dark, brooding, moody feel that enhances the story he is telling. 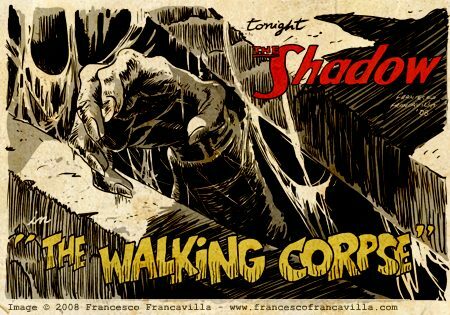 He uses light and shadow to create an unsettling mood and sense of dread. It's amazing how something as simple as a shadow cast across a wall is used to so effectively create an atmosphere of dread. Sound and music are also used to enhance the tension—the native drums and singing really bring the world of Caribbean voodoo to life. When most people think about zombie movies, they think of films typical of George Romero or Wes Craven. 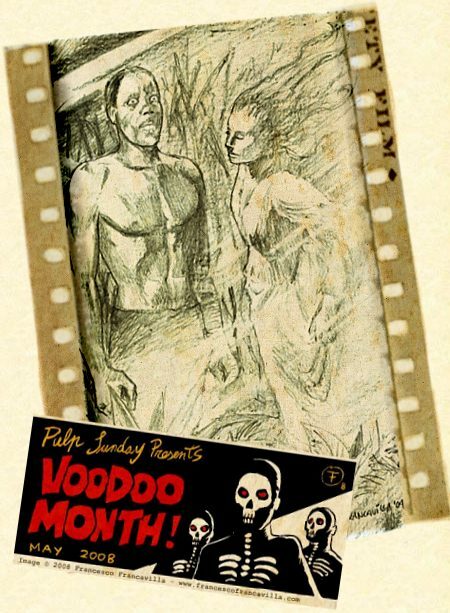 This film instead focuses more on the voodoo aspect of zombie lore. Probably the most memorable character is the native zombie Carrefour, played by Darby Jones. With his skeletal figure and protruding eyes, he is easily the creepiest looking zombie ever filmed. 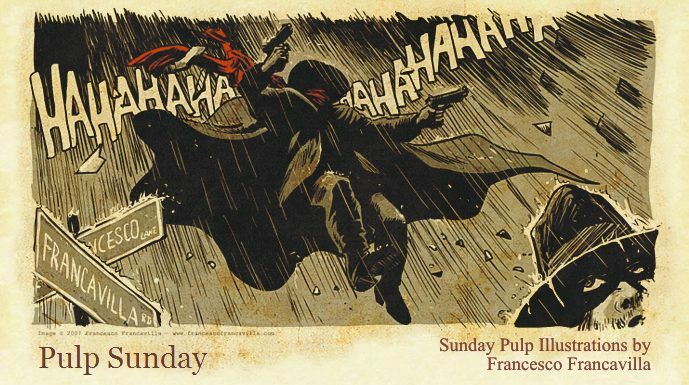 Welcome to first edition of Pulp Sunday Presents: Voodoo Month ! I am going to feature several episodes of the Shadow dealing with one of the most ancient magic, the one that is so powerful that can bring people back from the dead! 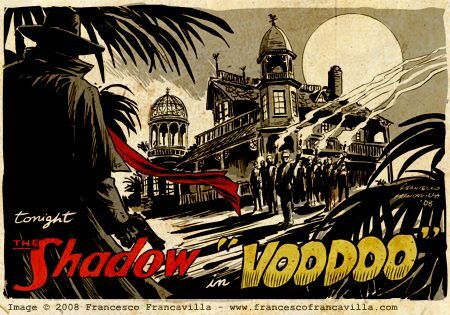 And it will be not just about the Sunday Shadow radio-shows: I am going to add here and there (based on my schedule of course ;)) movies and other voodoo stuff. A trip down to an island not too far from the Georgia Coast; an island where the natives practice a voodoo cult which consists in worshipping the reptiles; a powerful amulet called the "snake stone" to be weared around the neck; a murder case (of course); and a guy called Sebastian who will turn out to be a key figure in this whole story. That's the first episode I featured on this blog that starts with some sort of camp-fire, spooky/ghost story tales, with Margot and Lamont telling the adventure that saw them dealing with a massive crowd of vooddo followers and surviving to it.